Even as horrific instances of nursing home abuse become more well-known to the public, the sad truth is that nursing homes continue to engage in this behavior. They may do so out of the fact that few lawsuits have been filed against that particular nursing home to hold it accountable for its atrocious behavior. No one seems to have the power to enact change in the nursing home care systems except for licensed attorneys. According to information gathered by Medicare, there are 226 nursing facilities rated in Maryland quick data from surveys and inspections. 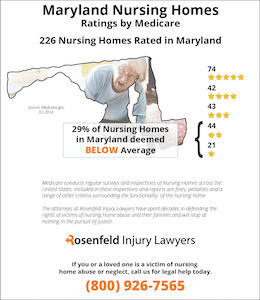 The federal agency states that sixty-five (29%) of these Maryland nursing homes are rated below the national average after severe violations and deficiencies were identified by investigators. If your loved one died prematurely or was injured, abused, mistreated or neglected while residing in a Maryland nursing home, contact the Maryland nursing home abuse & neglect lawyers at Nursing Home Law Center today to discuss out to you can receive financial compensation. We offer every potential client a free case review to evaluate the merits of their claim. Attorneys in Maryland have a commitment to supporting loved ones who have been forced to deal with abuse and neglect affecting a loved one. The development of bed sores, noticeable cuts or abrasions and anxiety issues are all results that can happen when one is abused. It is important for family members to speak with attorneys when they are concerned that a loved one is being abused. 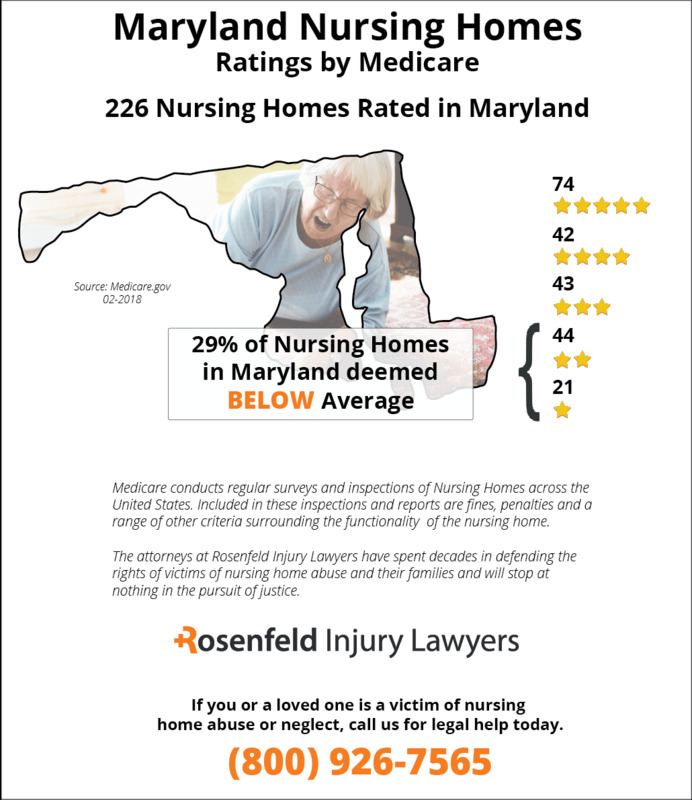 With over 68 percent of Maryland nursing home receiving deficiency ratings in the quality of care provided to residents, it is time for family members to receive the legal help they need to deal with Maryland nursing home neglect. In Maryland, nursing home abuse laws are in place to protect the legal rights of nursing home residents. The governing sources of authority can be found in the Adult Protective Services Act, Institutional Abuse Act, Long Term Care Act and Nursing Homes Act. All of these pieces of legislation have been developed to provide widespread protections for nursing home residents. In particular, nursing home residents are susceptible to being victims of financial exploitation in nursing homes. In light of the poor economy, many nursing homes seek to take unauthorized funds from nursing home residents. Specific laws like the Elder Justice Act of 2009 provide a procedure for dealing with issues like abuse and financial exploitation. Any suspicion of abuse must be reported, and then owners of nursing home facilities must notify the government of a plan to transfer the resident. This Act now empowers more family members to take their loved one out of a bad situation and receive the help that they need. Your loved one also has certain rights subscribed under federal law in a nursing home. The Nursing Home Reform Act of 1987 is a major piece of legislation that has a list of residents’ rights. The major right of residents is to be free of abuse, mistreatment and neglect. Nursing home residents also have other rights such as the right to use self-determination, be free from physical restraints, right to have privacy, right to have medical accommodations, right to participate in social groups, right to be treated with dignity, right to review one’s care plan and right to be made aware of changes in a nursing home program or care plan. If a loved one ever complains of abuse or other situations that violate these rights, family members should pay close attention to such complaints. Family members should be ready to react to such complaints and file a report. If you are unsure of what to do after a loved one has complained about abuse, then get in touch with a Maryland nursing home lawyer today. A Maryland nursing home lawyer can carefully consider any allegations of abuse and determine an appropriate way to proceed. 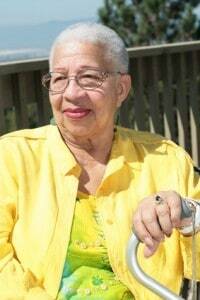 Maryland nursing home lawyers will be able to help you handle this overwhelming situation. You have the right to stand up for your loved one to ensure that he or she receives treatment that is in accordance with the law. A bedsore can be developed or exacerbated when the patient is immobile and unable to reposition their body on their own. The immobility causes pressure on body parts to restrict blood flow causing damage to the skin. As a result, many patients in nursing homes require routine turning or readjusting to minimize the amount of pressure on their skin. The vast majority of bed sores acquired during a nursing home or hospital admission are due to improper care. When it comes to the prosecution of Maryland pressure sore cases Nursing Home Law Center LLC is committed to holding facilities accountable. We invite you to contact our Maryland bed sore attorneys for a free review of your case. A bedsore (decubitus ulcer; pressure sore; pressure ulcer) is usually avoidable if the patient is provided routine movement and quality nutrition. Any developing pressure sore in its initial stage can be reversed within a few days with appropriate treatment. However, if left unattended, it can quickly turn into a serious open wound susceptible to life-threatening infection. A bedsore begins as damaged skin caused by a lack of oxygenated blood to the area. Typically, bedridden and wheelchair-bound patients in a nursing home sit or lie in one position for an extended time. When the skin continually contacts bedding material or padding, the weight of the body applies pressure and cuts off blood flow. Within two hours, the skin can begin to die or become permanently damaged. However, with routine turning or readjusting the body, blood flow is allowed back into the area to alleviate the problem. Making sure the patient has adequate healthy food is crucial. Cleaning the pressure ulcer through debridement or other protocol is essential to stop its progression and ensure it does not cause permanent damage. Nearly every type of Stage I & II bedsores can be healed nearly completely, with only minimal damage to the skin. The fluid filled blisters and red spots symptomatic of Stage I bedsores can diminish after just a few days. The small crater that forms in a Stage II pressure sore can heal with simple debridement, where dead skin and tissue is cut away from the wound. However, Stage III & IV pressure sores are difficult to resolve. Far less than 50 percent of these bedsores ever heal completely. In many cases, intervention by a highly skilled specialist trained in treating life-threatening pressure sores is required to ensure survival of the patient. If you have a bedridden loved one who has developed a pressure ulcer, the nursing facility administration, attending nurse and caregiver need to be alerted immediately. It is essential that caregivers are providing your loved one special foam cushions, pressure relieving pillows or sheepskin materials to minimize the pressure on the sore. In addition, it is crucial that your loved one is receiving proper nutrition and hydration, while being kept dry and clean at all times, even if they are suffering severe incontinence. Finally, it is essential to hire a Maryland bed sore lawyer to file a claim against the facility and all parties responsible for the negligence. Fill in the form here to contact a Maryland nursing home abuse attorney to assist you in filing a claim for compensation against a Maryland nursing home or hospital for a pressure sore that developed at their facility. Their legal efforts can provide you adequate money to pay for the specialized medical care and additional recompense for your loved one’s pain and suffering.